Wired Productions announce the launch of its online store to support the launches of Victor Vran: Overkill Edition, and The Town of Light. The collector’s editions for each game will be available on the PlayStation 4, Xbox One, the all-in-one games and entertainment system from Microsoft, and Windows. As part of its commitment to its development partners and fans alike, the online store will offer exclusive collector's editions which go beyond traditional initiatives, with more content, incredible value and unique offerings, including specially created extremely limited edition products. The Wired Productions Store launches today alongside the Victor Vran: Overkill Edition Collector’s Edition featuring Motörhead, a must have for any dedicated Action RPG fan and Motörheadbanger, containing officially licensed merchandise and exclusive Motörhead Through the Ages goodness. Additionally, the exclusive The Town of Light Collector’s Edition, provides a never before seen glimpse at the development of a reality based adventure game and a photographic extravaganza of the world which inspired it. Both collector’s editions will be available for shipping to worldwide locations. 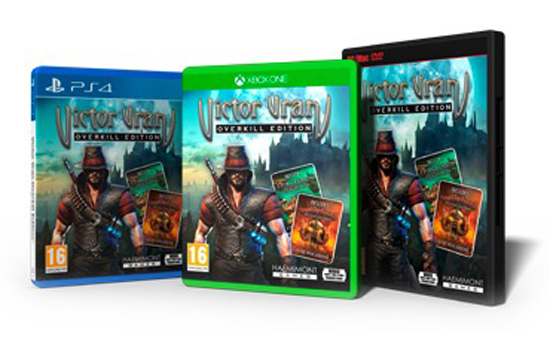 Victor Vran: Overkill Edition features brand new content and complete with visual enhancements alongside outstanding performance at 60fps. Two new content expansions included in the Overkill Edition, are the ethereal Fractured Worlds, a challenging and empowering new chapter in the story of Victor Vran, and Motörhead: Through the Ages – a wild, heavy metal adventure inspired by, officially endorsed and starring the loudest band in the world.